So when it came time to do The Texas Chainsaw Massacre 2, Hooper and writer L.M. Kit Carson (Paris, Texas) decided the only way to respond to this “cinema of excess” was with satire. The sequel – produced and distributed by Cannon Films – was a parody of slasher flicks, with over-the-top gore effects from macabre maestro Tom Savini. Unfortunately, audiences were expecting a brutal, terrifying experience akin to the original, not a horror-comedy like Dan O’Bannon’s Return of the Living Dead. As a result, the film was met with a tepid response from critics and moviegoers alike. 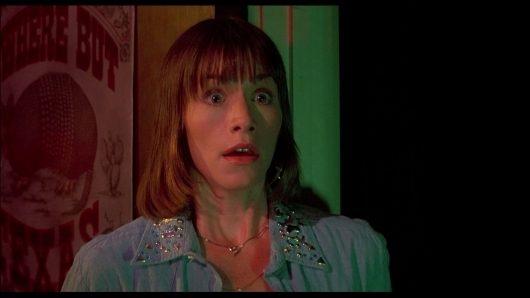 In the thirty years since its release, The Texas Chainsaw Massacre 2 has aged remarkably well, playing as a surreal black comedy and a tongue-in-cheek response to the ’80s slasher explosion. Thanks to those fine fiends at Scream Factory, this cult classic finally gets the treatment it deserves in a beautiful two-disc collector’s edition Blu-ray packed with extras. If you’ve never seen the film, it picks up a decade later, with Texas Ranger Lefty Enright (Dennis Hopper) hunting down the Sawyer family – Leatherface (Bill Johnson), Chop-Top (Bill Moseley), The Cook (Jim Siedow), and Grandpa (Ken Evert). With the help of a radio DJ (Caroline Williams), Lefty finds his way to the Sawyers’ underground slaughterhouse, and an epic battle between men, women, and chainsaws ensues. 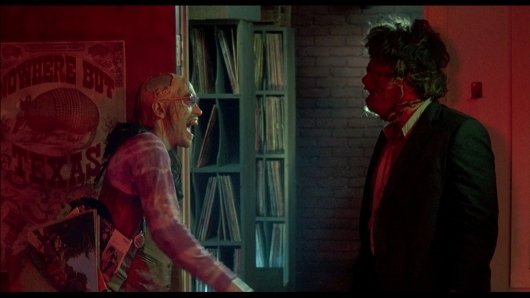 The Texas Chainsaw Massacre 2 is one of my favorite horror films, and one of the most intriguing sequels ever made. From the whacked-out performances by Hopper, Moseley, and Siedow to endearing turns by Lou Perryman and Caroline Williams, it’s the most fun you could have watching a horror movie. Scream Factory’s new 2K transfer is great, besting Arrow Video’s UK release and the previous MGM transfer, with rich colors and improved black levels. This is without a doubt the best Hooper’s film has ever looked and sounded, and it makes a great companion to MPI Media Group’s 40th Anniversary Edition of the original The Texas Chain Saw Massacre. 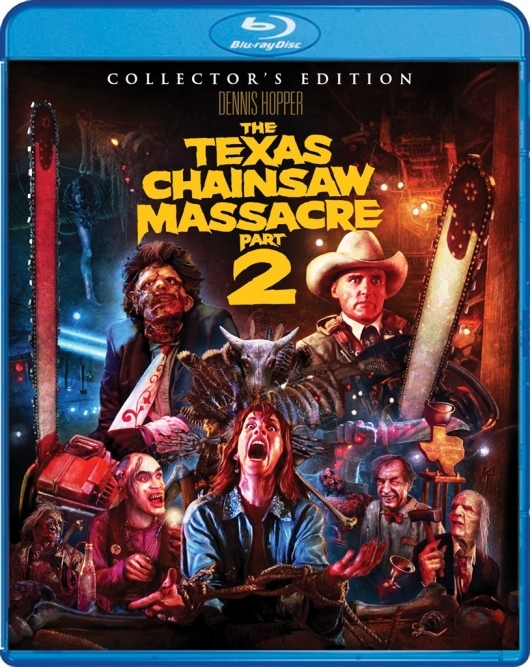 Scream Factory’s Blu-ray collector’s edition of The Texas Chainsaw Massacre 2 is now available at Amazon. For a summary of this release’s bonus features, of which there are many, and the film’s trailer and cover art, keep reading! In addition to a new 2K scan of the interpositive film element, the first disc includes three audio commentaries: a brand new one with director of photography Richard Kooris, production designer Cary White, script supervisor Laura Kooris, and property master Michael Sullivan; one with director Tobe Hooper, and another with Bill Moseley, Caroline Williams and special effects makeup creator Tom Savini. There’s also new outtakes and behind-the-scenes footage from Savini’s archives, as well as an alternate opening credit sequence, deleted scenes, still galleries, and trailers and TV spots. The second disc is packed with tons of bonus materials, including It Runs in the Family, a six-part feature-length documentary featuring interviews with screenwriter L.M. Kit Carson, Bill Moseley, Caroline Williams, Bill Johnson, Lou Perryman, Tom Savini, and more. There’s also a collection of new interviews with make-up effects artists, editors, stuntmen and actors Chris Douridas and Barry Kinyon. Another great featurette is New Horror’s Hallowed Grounds, where host Sean Clark revisits the locations of the film. For completists, MGM’s original HD master – approved by Hooper and supervised by Kooris – is also included.